This mattress lives up to its name, which you can hardly complain about. It's makes for a comfortable night's sleep, but is, on balance, best reserved for the spare bed or for children's rooms to guarantee its longevity. If you're looking to find the best mattress for your needs, you'll find plenty of choice in our mattress guides – but don't miss our deep reviews first. Here, I'll be reviewing the AmazonBasics Extra Comfort mattress. Who will the AmazonBasics Extra Comfort mattress suit? Anyone seeking a no-frills, penny-saving mattress for the spare bed or young children. What's the Extra Comfort like to sleep on? When I first heard that Amazon was producing an own-brand memory foam mattress, and then clocked the frankly astoundingly bargainous price points, I knew I had to check it out. I am a firm believer that you ‘get what you pay for’ in life (except when you’re being ripped off, obvs) so my expectations were pretty low, if I am honest. And when we first rolled it out onto the bed, they stayed low. But not as low as the mattress. 'It looks like a sanitary towel,' commented Nick. He had a point. Now, all the vacuum-packed mattresses that have come through our door have taken a few hours to bounce back into shape, so this initial state of play wasn’t completely unexpected. Checking on progress four hours later, it hadn't filled out. Bonnie – the 4 year old – laid on it, and started laughing her socks off because she could feel the slats of our bed beneath. Hilarious. Another three hours and it was our bedtime, still flat, so we gave up and switched our normal mattress back on, while Nick muttered darkly about sleeping in the spare room. Then I happened to pick up the flyer that came in the box and, lo, it advised we wait 72-hours. Bad Bonnie. So my first tip is, do not buy this mattress as an emergency replacement. Fast-forward three days, and the mattress went back on. It had definitely thickened up, but the cover was still suspiciously baggy (and still is, two-weeks later as it waits in the spare room for collection by a local charity). However, and this was a massive relief on the marital harmony front, once you get horizontal, the mattress felt surprisingly good. There were no sighs of blissful comfort as we lay down, but, thankfully, there was no sign of the slats below and our shoulders and hips sunk in all the right places. Plus there wasn’t the nasty chemical smell of many foam mattresses – big tick! The next morning’s debrief revealed that Nick had slept perfectly well, as did I, and he had no complaints. Until he tried to get out of bed, which was a bit of a struggle for the old man, what with the mattress being much closer to the ground than our usual pocket sprung. Luckily I am (much) younger and had no problem getting vertical. Second tip; maybe avoid if you’re old and cronky, unless you have a high divan-style base (ours is a traditional wood frame)? So, the lack of motion transfer in this mattress is best explained by Bonnie, who did a quick jump test. After nearly crippling her ankles a few times, she informed me that it 'feels deader than a dead dog mummy'. Quite, but should I be worried that she is secretly killing dogs? Anyway, this mattress scores highly on motion transfer – there is none. On the (very subjective) subject of firmness, Amazon rates it as medium-firm, but Nick and I would both call it firm. There is a reasonable depth of memory foam (3cm) as the top layer, but the core below must be pretty sturdy, as it feels fairly robust as a whole (and we like a firm mattress). Wheeling our tame testers (three male, three female, ranging from 10 to 17 stone) back out of temporary retirement just served to support our judgment. They rated it between 7.5 to 8.5, with 10 being the firmest, and everyone agreed it was neither extra firm, nor medium to firm – just firm, firm. The heaviest of our buddies was really happy that he’d found a mattress that stayed firm throughout his 20 minute trial. Bless him. The weight test (below) was really interesting, given the above firmness reveal (if you’re a bona fide mattress nerd that is, if not, feel free to skip). So on the side of the mattress, our rusty old 56lb weight weighed in at 6 to 7cm, which is, loosely speaking, how far it sank into the mattress. This kind of figure sits pretty well with the other firm mattresses we’ve tried. But, upon hefting it into the middle, the sinkage rose to 8 to 9cm, which is closer to what you might expect from a medium to firm mattress, which supports Amazon’s claim. However, Nick and I didn’t suffer from any roll-together, thank the good Lord, and nor did I feel like the mattress was softer in the middle after I’d kicked Nick out in the mornings. Curious. The posture test (below), which is arguably the most telling of our tests, was fairly decent. Nick’s spine sat reasonably aligned in side-sleeping mode, and, after a week sleeping on this mattress neither of us experienced any back or neck pain or any general aches for that matter. How does the Extra Comfort rate online? The 95 Amazon shoppers who have taken the time to rate this mattress so far award it an overall figure of 3.8 out of five stars (59 per cent give it five stars, and a cheeky 9 per cent go for one). There are quite a few people reporting they have found it is too firm (but then again they were expecting medium-firm) and the happiest customers seem to be those who bought it for their guest bedroom or children. In fact there’s a lot of enthusiasm about how much children love this mattress. Amongst the naysayers, there is a concerning amount of chat regarding ‘dipping’ after three-to-six months of nightly use. Tip number three: maybe don’t buy it for your main bed. A decent wedge of memory foam, a washable cover, and seven-zone comfort (see below). It is one-sided and, a rare but painfully simple bonus, this mattress has a handy sign telling you which way up it goes. You’d be amazed how many don’t make it clear. Is the Extra Comfort worth it? Considering how little this mattress costs, only a complete Scrooge could argue that it doesn't represent value for money. However, I would probably agree with the majority of Amazon’s happy customers and suggest that you reserve it for your spare bed or children (who are generally so light they can sleep comfortably on anything). I’m saying this mainly because of the reports that it will dip in time, so if it’s used infrequently, or by those not heavy enough to dip a sponge cake, this issue may never arise. But also because, while this mattress is perfectly comfortable, and far more comfortable than either of us were expecting, it is completely devoid of luxury. There’s none of the super-squishy cover, stylish colours, bounce or chunkiness you get from pricier alternatives. Then again, it is sold as an ‘AmazonBasic’ so one can hardly complain that it lives up to its name. 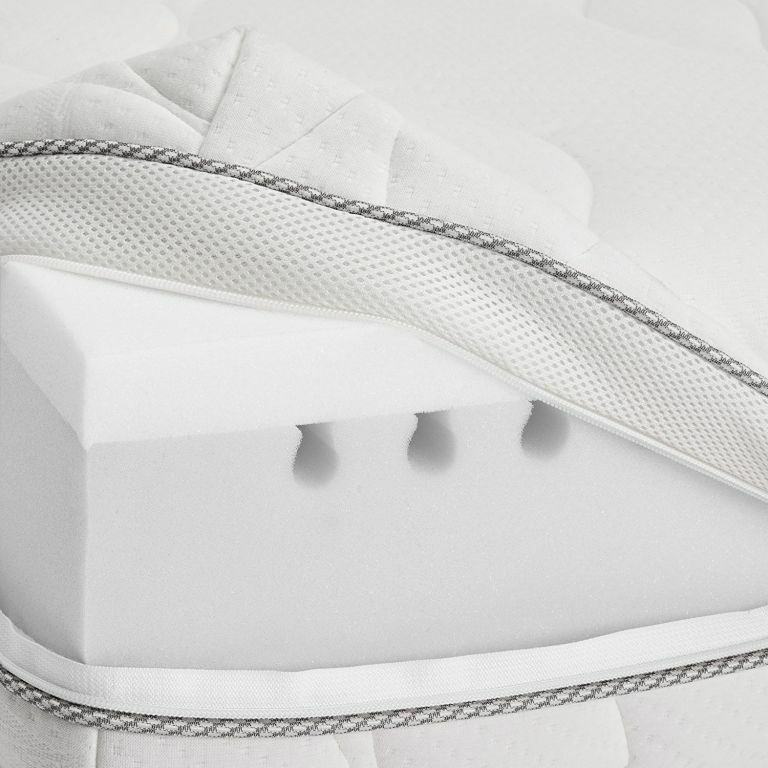 This is a simply constructed mattress consisting of a thick Zoned base layer, which basically means the foam is sliced to provide varying resistance under key body parts, namely the knees, hips, shoulders and neck. On top sits a 3cm-thick layer of memory foam, which adds a little comfort to the firmness. The cover looks fairly unassuming, and feels pretty synthetic if I am honest, but apparently its breathable 3D edge tape helps keep the foams within aerated (and I will agree that I didn’t feel like I was being heated by this mattress). It is also Medicover-treated for protection against dust mites and bacteria, which is a nicely reassuring touch. Combined with the cover, this mattress measures 20cm deep (according to Amazon, my tape-measure says 18cm), while most memory foams are at least 25cm. Unfortunately that 5cm to 7cm difference is noticeable. It arrived in the usual timely manner you can expect from Amazon, neatly squeezed into an unfeasibly small bag, which made it very easy to carry upstairs, and may well account for why it requires 72 hours to regain its composure.